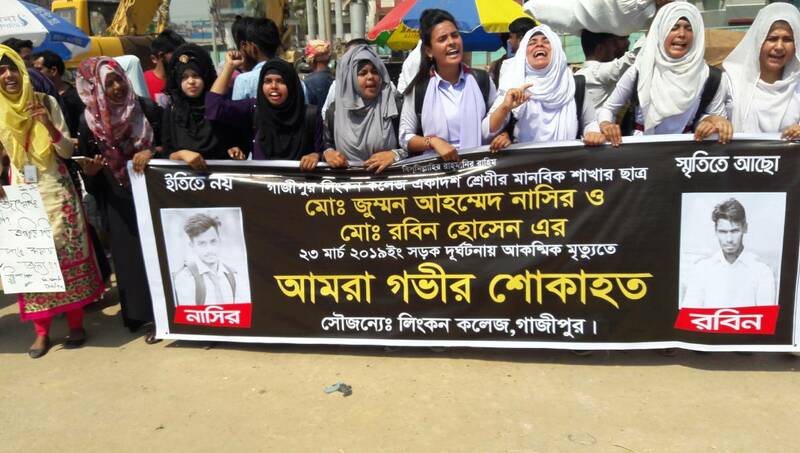 Students blocked Dhaka-Mymensingh-Tangail highway at Gazipur intersection on Sunday morning demanding safer roads and protesting the killing of two college students in a road crash on Saturday. Several hundred students of different colleges including Bhawal College, Lincoln College, City College and Commerce College gathered on the highway and blocked the busy intersection chanting slogans, holding placards. Their demands include arrest of the driver of the killer bus and safer roads across the country. Jumman Ahmed Nasir and Robin Hossain, HSC first-year students of Lincoln College, were killed as a bus hit them in Salna area on Saturday.